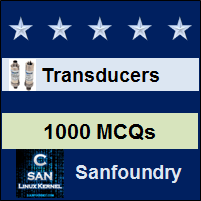 This set of Instrumentation Transducers Multiple Choice Questions & Answers (MCQs) focuses on ” Analysis Instrumentation”. Explanation: All bodies behave as a source of electromagnetic radiation under an excited state. 2. Which of the following represent a spectrum of frequency emission? Explanation: All bodies behave as a source of em waves and spectrum of frequency emitted is known as emission frequency. 3. Spectrography doesn’t compute the energy of frequency spectrum. Explanation: Spectrography can be used for calculating the energy of frequency spectrum. 4. Which of the following source is used for exciting bodies electrically? Explanation: Electrical excitation of body can be carried out using DC arc, AC arc and spark. 5. Which of the following is more used core in spectrometer? Explanation: Graphite is more used material than carbon as core in a spectrometer. 6. Which of the following represents emission spectra? Explanation: Emission spectra are divided into continuous spectra, band spectra and line spectra. 7. Every spectrograph requires dispersion. Explanation: Spectrograph processes dispersed radiation. Explanation: For dispersing radiation, prism or grating elements are used. Explanation: Due to uniqueness IR absorption pattern in absorption spectrography is called fingerprint. 10. Which of the following represents the fingerprint region? Explanation: IR spectrum ranging between 7um to 15um wavelength offer the best discrimination between molecules and hence identified as fingerprint region.